Spring never fails to bring all the things we love to the forefront like pastel and earth tone colors, a fresh breeze, flowers growing and birds chirping. Life is good. Then you realize you have a accumulated a lot of new stuff in the recent season. It’s due time for some spring cleaning, and for some this task might be a major mood killer. Fear not for Bookmans is here to help! If you are anything like me, extreme cleaning is something you try to get away with doing a few times a year. When cleaning time comes you may be doomed to sorting through piles of stuff that you don’t use, need and sometimes don’t know what to do with it. Spring cleaning doesn’t have to be as arduous as you might be imagining it to be and we’re here to re-assure you that we won’t leave you hanging. Here’s a tip to help you get a jump start. Throughout cleaning you might find items like an old DVD or VHS player, houseware pieces you don’t use, a gaming console and games that aren’t being played anymore, even jewelry that you never wear. Whatever it may be, you have to decide which items you don’t have use for and be ready to let go. Hang in there, because once you have made your decisions the hard part is complete! Now you’re probably asking yourself “what am I going to do with all this stuff now?” Well, this is where our tips come into play! 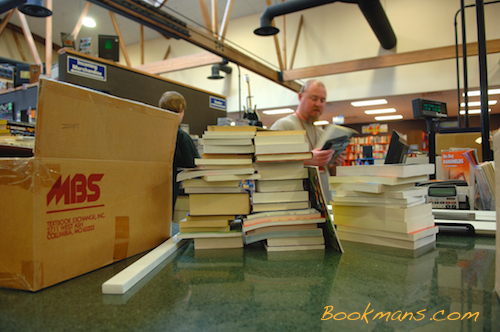 Buy, sell and trade with Bookmans! It’s always been said that one man’s junk is another man’s treasure. Simply, bring in the items you no longer use (books, magazines, comics, music, movies, video games, musical instruments, electronics, housewares and more.) While you shop and hang out, we sort through your items for things we can sell in our stores. When you come back to our trade counter we will have an offer ready for you in Bookmans trade credit or cash. Why not get some Bookmans trade credit or cash in return for you old items? For more info on how to trade, head to our Buy, Sell, Trade page. Spring cleaning is a tricky task, but it can be made easier with the support of your nearest Bookmans location. Find out which store is closest to you on our store page, then get to cleaning. You’ll be overjoyed with all of that new clean space at home and room to spare for all of the cool new stuff you can purchase with your trade credit. Best of luck spring cleaners!